L'Hermitage - 788 Richards Street Vancouver BC. L'Hermitage - 788 Richards Street, Vancouver, BC. 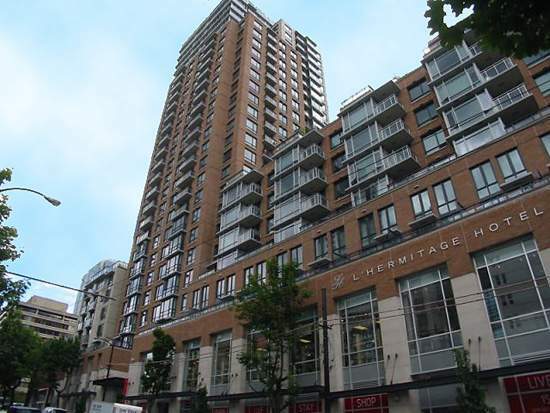 L'Hermitage at 788 Richards Street, Vancouver, BC, V6B 3A4, Corner of Robson & Richards, 204 suites, 32 levels. L'Hermitage en Ville. Suite deluxe features incl; Bosch & Sub Zero appliances, Modern Eggersmann kitchen cabinetry imported from Germany, 8’8” ceilings, wide plank HW floors, designer loop carpeting in bedrooms & rarely available “Air Conditioning” Building also has a health club with a fully equipped exercise room, club lounge, Concierge Service & security card access. The three secrets to a signature address: luxury, presence, taste. A residence of fine distinction in the heart of a city - L'Hermitage en Ville - on Robson, Vancouver's world-famous shopping promenade. L'Orangerie Lounge available for hotel guests & suite owners between 6;30 - 10AM for continental breakfast at $15 per person & is open until 10 PM nightly on level 5 with Free Wireless Internet.